Round Towers are found in many parts of Ireland, usually associated with former monastic settlements. It was once thought they were built as places of refuge from the raiding Vikings over a 1200 years ago. After all they were built like small castles and the only entrance was 10 feet above ground level, accessed by a ladder. Although the monks may have tried to escape the raiders in the towers most experts now think the towers were built primarily as bell towers. Monastic settlements were more than just places of worship. The temporal welfare of the occupants needed to be catered for so this meant a lot of agricultural and industrial activity. A bell to announce times for the beginning and end of various activities throughout the day was essential for a well ordered society and these settlements could cover large areas and have many occupants. One of the best preserved towers is in Glendalough, County Wicklow. I have included it in this scene. By the way the reason why the entrance was so high up was because the towers were built without a foundation so the bottom of the tower was a solid lump of masonry, up to the height of the doorway, to stop it falling over. Like the last painting (here) this scene was sketched in with dry paint (unmixed with solvent or medium). Later colours are added on top and a certain amount of mixing happens to alter these colours. Its easy to control if the paint is kept dry. The more you work it, the more mixing happens. Still using just 3 colours and white only, no black. The colours are Raw Sienna, Raw Umber and Prussian Blue. White Spirits was used initially to spread the dry paint at the sketching stage and at the end to paint the fine lines of the trees and building details. Here is the video of the painting process. See you soon. 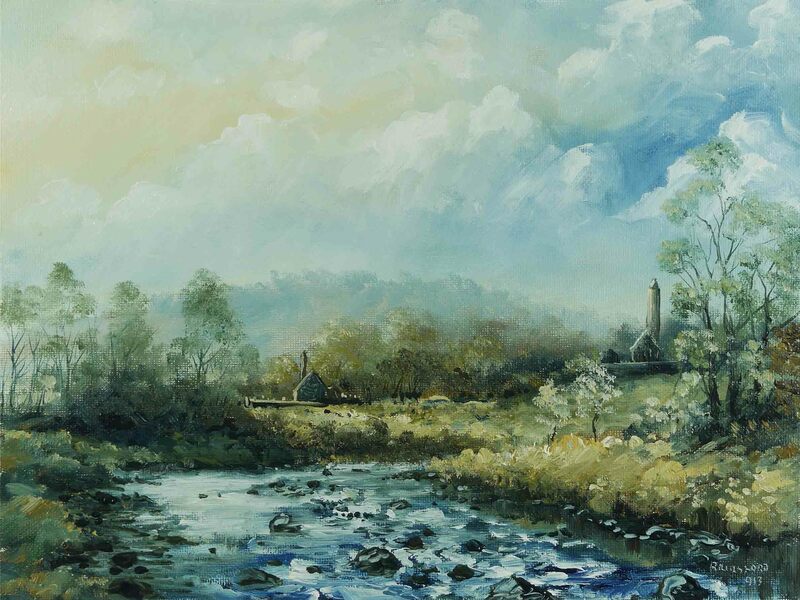 This entry was posted in Oil Painting and tagged Art, autumn, Culture, Irish landscape, Oil Painting, painting, Time lapse painting. Bookmark the permalink.